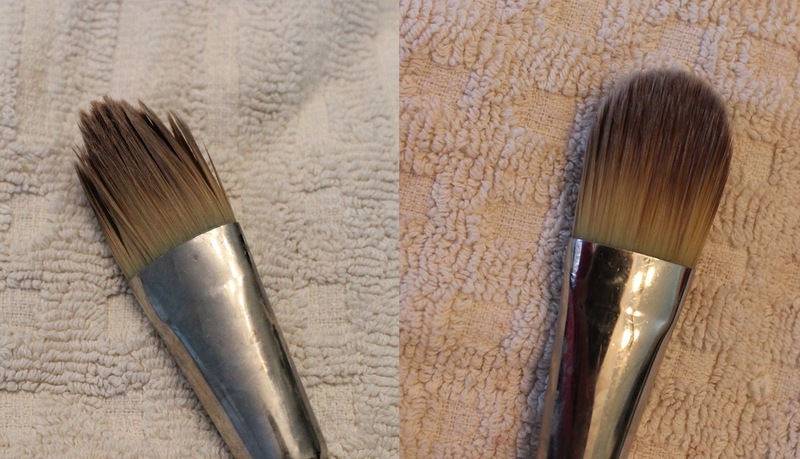 The (not so) clean mommy: I'm baaaaack-and how to clean your make up brushes! I'm baaaaack-and how to clean your make up brushes! This summer was rough. It was hard to get into a good schedule with both kids when we really didn't have to. Sleeping in, doing whatever we wanted all day, gymnastics camp, vacation, it was hard, made even harder by the fact that we had a pretty crappy summer and hubs took the car to work. So I was very excited for school to start up again so we could get back into a good routine. I was even more excited when hubs decided that he would start taking the bus to work so I could have the car. The kids are on a good schedule, the house is relatively clean and I have time to get work done without staying up past midnight every night. So with all that said, I'm back! I'm researching new cleaning products, apps and other products and systems to make life easier. But first, I'm going to tell you all about something I found yesterday. The EASIEST way to clean your make up brushes. I've become very careful over the past two years about the products that I use, mostly cleaning and personal care products. So as I'm in my bathroom last night soaking my brushes in make up remover, and using quite a bit of it, I see, and start thinking about, the handmade bar of soap I have on the side of my sink. So I think...why not? And boy did it work! The problem with the make up remover was that I couldn't get the make up from the inside of the brush. But with the bar, I could lather the brush right on it, and make sure that it got the bristles in the middle. You can see the make up coming of of the brush and onto the soap, and can see how you can really get the soap right into the middle of the brush. And I know that the soap is gentle, since that's why I bought it. When you've worked the soap into it a bit, you can literally just rinse the make up down the drain and keep going. My brushes are all so soft now. No more foundation residue or sticky greasy brushes. I wouldn't do this with my eyeshadow or powder brushes, only the concealer/foundation ones. The dry brushes I just clean with a tissue or a paper towel, although I could use soap if they got really dirty, but I haven't needed to yet. So there you have it. Clean house, clean brushes. And I have more posts coming, product reviews and maybe some giveaways, so keep checking in, and tell your friends!